This detached house was built in the late 1960's and stands on a mature west facing plot with FOOTPATH WALKS TO THE VILLAGE CENTRE and the Michael Hall School. The property is located at the top of the development and comprises one of only five built in this attractive style with colour washed elevations under a tiled roof. Internally the house has a reception hall, with parquet flooring and stained glass panel, leading into a lounge with door to the good sized conservatory. Adjacent to the lounge, through the double doors, is the dining room currently used as a snug. The remaining ground floor area comprises the generous, light and airy kitchen/breakfast room with the adjacent utility room, a cloakroom and a study at the front of the house. 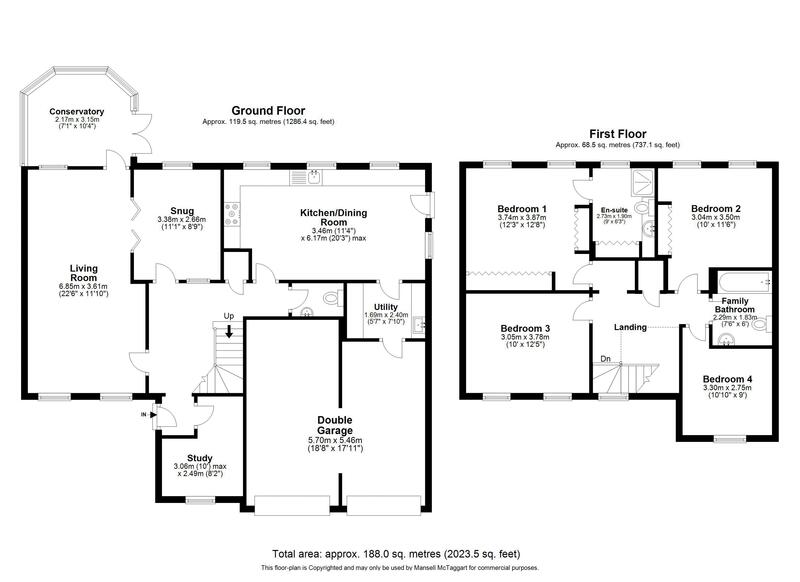 On the upper level there is a galleried landing, a master bedroom with good size en suite shower/dressing room, three further bedrooms and the family bathroom. The property has a good frontage with hardstanding parking for 4 vehicles in front of the double garage, with light and power and internal door to the main house, together with its twin up and over doors. The rear garden is laid to lawn and shrubs and being well screened with mature hedging whilst having a southerly side aspect. Directions: From our office take Priory Road, by the Church, and first left into Freshfield Bank. The house will be seen at the top on the right hand side after Gage Ridge. Freshfield Bank is a very popular mature residential development off Priory Road, set between Forest Row village and the Ashdown Forest with its 6,400 acres of beautiful heath and woodland. The house is well placed for footpath access to Michael Hall Rudolf Steiner School. The lively village centre can also be reached by footpath with its extensive range of cafes, restaurants, local shops and specialist stores. There are churches of various denominations in Forest Row together with a modern Health Centre. The immediate area is well represented with a wide range of both private and state schools including a primary school in the village, Ashdown House and Brambletye Schools, Emerson College, Greenfields and Sackville School in East Grinstead. The nearest town is East Grinstead, accessed via the A22, which has regular bus services, has a varied and larger shopping centre including several major supermarkets, sports/leisure amenities, and rail station providing a commuter service to Victoria/London Bridge. In addition this is linked to Bluebell Steam Railway which travels south to Sheffield Park. The bus services also connect to a number of other larger towns offering similar facilities including Tunbridge Wells, Crawley, Haywards Heath, and the City of Brighton and Hove. Sports facilities in the area include sailing/angling at Weirwood & Ardingly Reservoirs, horse racing at Brighton & Lingfield Park, hockey, rugby and netball at East Grinstead, motor racing at Brands Hatch, and football at Crawley Town and the Amex Stadium, home of Premiership team Brighton and Hove Albion. Places of interest in the area include National Trust at Standen, Wakehurst Place and Sheffield Park, and Borde Hill Gardens, Hever Castle and Penshurst Place, and numerous events at the South of England Showground.